common on Wednesday, Nov. 12 at 7 p.m. at the library’s Central Branch, 79 Highland Ave., as part of its “Muslim Journeys” programming series. The series is free and open to the public. The discussion, “All Abraham’s Children: What Judaism, Islam, and Christianity Share,” will feature Dr. Ghiath Reda of the Islamic Center of Boston, Rabbi Eliana Jacobowitz of Temple B’nai B’rith of Somerville, and Rev. Jeff Mansfield of the First Church of Somerville. The panelists will discuss the common ground among their religions—from their origins in the Middle East to the patriarch Abraham as a part of their history—and what they can learn from each other. Alexis Gewertz of the Center for the Study of World Religions at Harvard Divinity School will moderate. The “Muslim Journeys” program is funded by the National Endowment for the Humanities and the American Library Association, and aims to familiarize the American public with Islam and the cultural heritage of Islamic civilizations around the world. 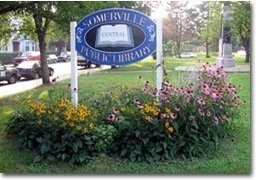 For more information, visit www.somervillepubliclibrary.org, or call 617-623-5000.